The Rad Lab, short for “Radiation Laboratory,” was the site of Manhattan Project research at the University of California, Berkeley. Ernest Lawrence formed the lab in 1931, three years after his arrival at the university. During his early research, Lawrence discovered that German scientists had managed to accelerate charged particles at lower voltages than had previously been possible. Lawrence immediately envisioned his own device that would accomplish the same acceleration in a more efficient, improved manner. He rushed out of the library, exuberantly proclaiming to a passing colleague’s wife, “I’m going to be famous!” In one year, he had a small working model of the device, called a cyclotron. Lawrence built his first model for the cyclotron out of scraps and shards of glass, with help from fellow physicist Stanley Livingston. Known as “atom smashers,” cyclotrons accelerate atoms through a vacuum and use electromagnets to induce collisions at speeds up to 25,000 miles per second. The results of these experiments provided valuable clues about the behavior of atoms. Lawrence would receive the 1939 Nobel Prize in Physics for developing the cyclotron. New and improved versions of the device emerged quickly: in 1931 an 11-inch cyclotron sat in the Rad Lab, in 1939 it had been replaced by a 60-inch iteration, and by 1942, Lawrence had created a 184-inch machine. 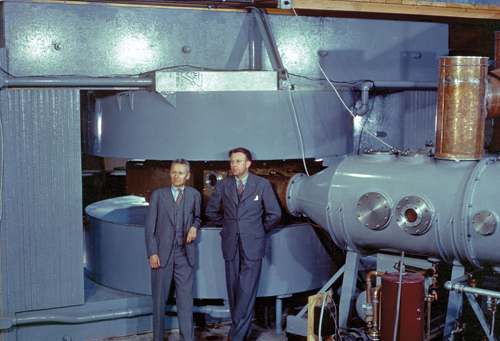 As the cyclotron evolved, so did its name, which became calutron to designate its origins at the University of California. Lawrence believed his machines could separate U-235 by electromagnetic separation, one of the four possible uranium isotope separation methods under consideration during the Manhattan Project. Although Lawrence asserted the potential of the calutron, he advised General Leslie Groves to pursue other methods separately. Heeding Lawrence’s advice, Groves arranged for the continuation of other methods of uranium production elsewhere, but remained committed to the Rad Lab’s electromagnetic separation as the primary method of U-235 isolation. The model for the calutron was subsequently used at the Y-12 plant facilities at Oak Ridge, Tennessee, for uranium enrichment. 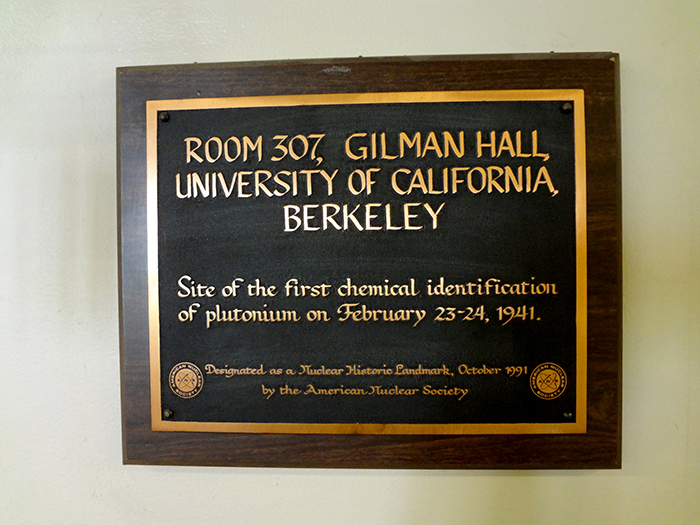 While Lawrence’s cyclotron work gave the Rad Lab a name in uranium research, a simultaneous and equally important discovery of another fissionable element, element 94, occurred on Berkeley’s campus. By 1940, Berkeley chemistry professor Emilio Segre believed that the mysterious force obtained from element 94 could substitute for U-235 in nuclear reactions. Berkeley professor Glenn Seaborg was also conducting research on the element to identify and separate the substance. Seaborg had produced the element neptunium, from which element 94 was produced, by bombarding uranium with neutrons. Seaborg had also managed to isolate several materials from his sample of bombarded uranium, including a piece of material that appeared to contain element 94. Throughout January and February of the following year, Seaborg and Segre worked together along with chemistry professor Joseph Wade Kennedy to isolate and investigate the properties of element 94. In March, Seaborg, Segre, and Kennedy announced the discovery of element 94, which they named plutonium, using Lawrence’s 60-inch cyclotron. Seaborg’s group established that plutonium atoms, when bombarded by neutrons, fissioned just as easily as U-235. The landmark discovery fueled the hopes of Groves and other key Manhattan Project administrators and scientists, who hoped with the rise of plutonium that a new bomb could be created that would fission more successfully. Seaborg’s research led to the creation of Manhattan Project facilities in Hanford, Washington, dedicated to producing plutonium for an atomic bomb. This plutonium would eventually be used in Fat Man, the plutonium bomb dropped on Nagasaki on August 9, 1945. 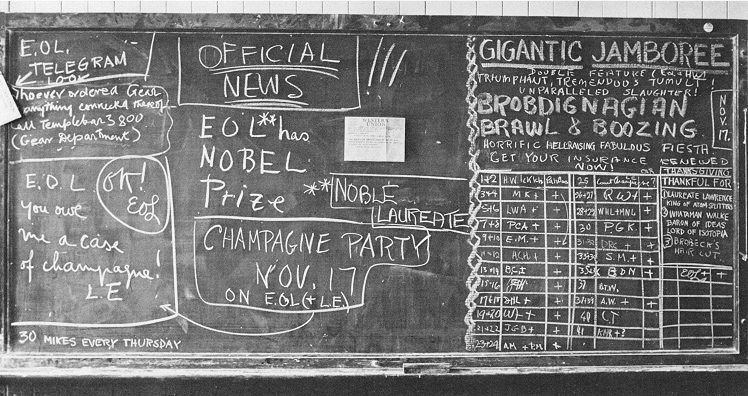 The scientists at Berkeley first entered the war effort through the efforts of the MAUD Committee, the British group that formed to discuss the logistics of an atomic bomb program. In 1941, the MAUD Committee sent a report to the U.S. Uranium Committee emphasizing the military possibilities of atomic energy. With no reply, Australian scientist Mark Oliphant flew to Washington, where he met with Lyman Briggs, an engineer, physicist, and administrator to Roosevelt, and was disappointed to find that “this inarticulate and unimpressive man had put the reports in his safe and had not shown them to members of his committee." Frustrated, Oliphant visited Ernest Lawrence to explain the urgency of the situation. With the help of Lawrence, Oliphant's message eventually made its way to Vannevar Bush, who had recently been named chairman of the National Defense Research Committee. As a result, the Uranium Committee became the S-1 Project of the OSRD and after the US entry into World War II, the Manhattan Project. 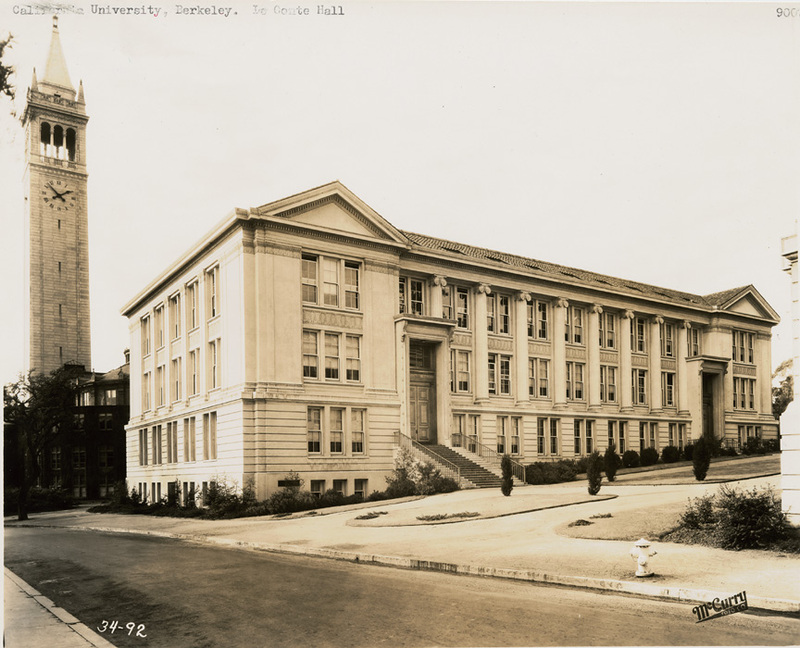 Berkeley had already become the center for theoretical physics in the United States, thanks in part to the efforts of a brilliant physicist named J. Robert Oppenheimer. In the summer of 1942, Oppenheimer organized a group at Berkeley to study the feasibility and design of an atomic bomb. The group of “luminaries,” as Oppenheimer called them, included Hans Bethe, Edward Teller, John Van Vleck, Felix Bloch, Robert Serber, and Emil Konopinski. The summer study focused much of its attention on the fission bomb design that would ultimately lead to the Little Boy and Fat Man bombs. They concluded that they could achieve a critical mass necessary to sustain a reaction through two methods: a gun-type design (used in the uranium-based Little Boy) or an implosion model using explosives to collapse a shell of fissile material (used in the plutonium-based Fat Man). The summer study, however, was also notable as the beginning of significant research into a different weapon design: the hydrogen bomb. In the months leading up to the summer of 1942, Teller and Konopinski had done work at the Chicago Met Lab where, according to Teller, they “concluded that heavy hydrogen actually could be ignited by an atomic bomb to produce an explosion of tremendous magnitude.” Thus, by the time the luminaries convened, Teller already favored a fusion bomb design over the fission model. The conclusions of the summer study led Vannevar Bush to report to the Secretary of War, “The physicists of the Executive Committee are unanimous in believing that this large added factor [the hydrogen ‘Super’ bomb] can be obtained… The ultimate potential possibilities are not considered to be very much greater than at the time of the [last] report.” The United States would go on to test its first thermonuclear weapon in 1952. The Rad Lab still exists today. 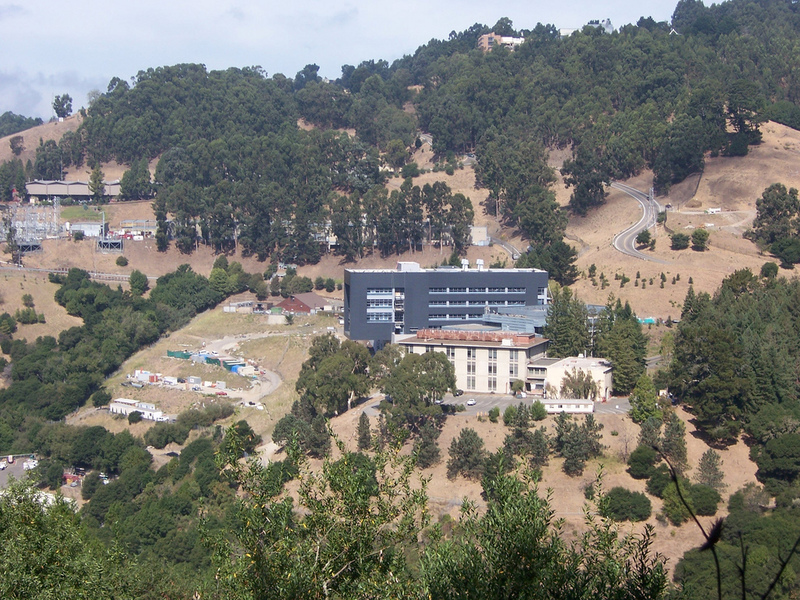 It was renamed the Lawrence Berkeley National Laboratory after Lawrence’s death in 1958 and continues scientific research on a variety of topics including plasma accelerators, magnet technology, and alternative energy sources. Extracting the gold foil containing atoms of the new element, mendelevium. In a video from the Berkeley Laboratory, Ernest O. Lawrence discusses the science behind the cyclotron. For more historic videos with Lawrence, check out the Berkeley Lab's YouTube page.